In many ways, the 2009 local elections foretell the result of the general election which came two years after it. Held a few months after the first Lisbon referendum, from which the governing Fianna Fáil emerged a shaken party, these elections saw Brian Cowen's party suffer further losses, at a scale which would have been thought impossible during Fianna Fáil's good years. These elections were held on the same day as the European elections, which saw FF lose a seat and remain in second place to Fine Gael, and the by-elections in Dublin South and Dublin Central. The latter took place after the death of Independent TD Tony Gregory and was won by his director of elections Maureen O'Sullivan. The former was due to the death of Fianna Fáil TD and Minister Seamus Brennan. This election was won in a landslide by celebrity Fine Gael candidate George Lee. Fianna Fáil, shockingly, finished a distant third. This disaster for the party was replicated all over the country in the local councils. 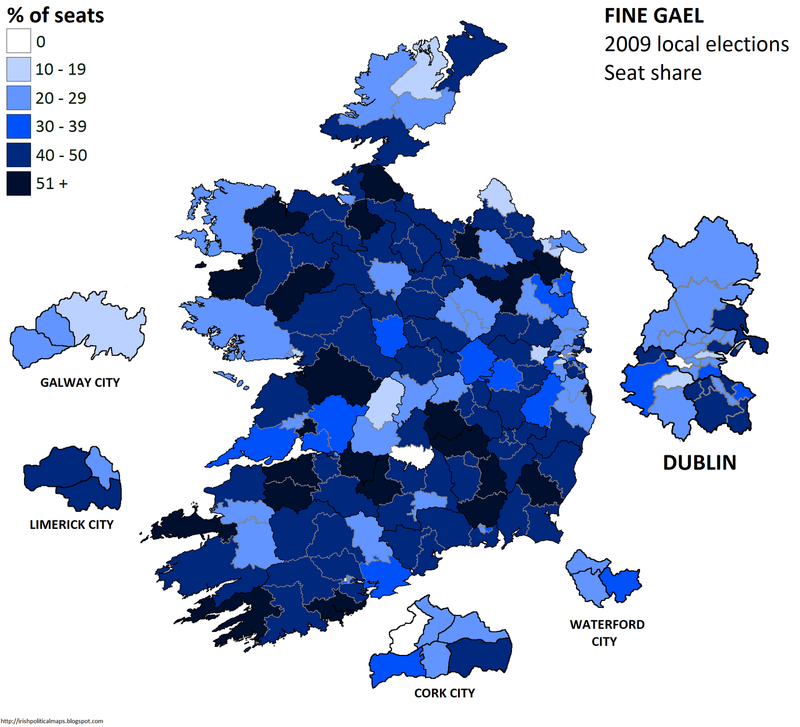 Fine Gael overtook Fianna Fáil at local level for the first time, and the "Soldiers of Destiny" were left with majorities in just four councils: Donegal, Westmeath, Offaly and North Tipperary. Monaghan went to Sinn Féin while Labour won Dublin City, Galway City, Fingal and South Dublin. Every other county and city council went to Fine Gael, setting it up for a strong campaign in the next general election. The Green Party suffered a similar loss, dropping from 32 seats overall to just 18. Fine Gael and Labour gained 88 and 43 seats altogether, with Fianna Fáil losing 135. Left wing parties fared well in Cork and Dublin, with the Socialist Party winning 6, the People Before Profit Alliance winning 5, and the Workers' Party holding 2. Sinn Féin made small increases to win a total of 127 seats, while Republican Sinn Féin surprised many by winning a seat in the Connemara district of Galway County Council. Independents increased in number to 275. 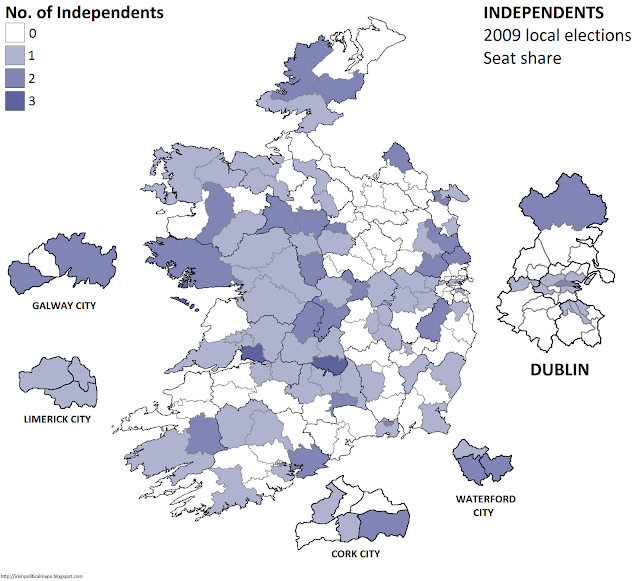 The maps below illustrate the seat shares won by each party, in percentage terms (except in the case of independents). Information about borough and town councils to come. A guide to the election results can be found here. A guide to the local electoral areas shown on the maps can be found here. Fine Gael benefitted the most from Fianna Fáil's decline, winning large majorities in many rural areas and south-east Co. Dublin. North Tipperary was the party's worst area, containing just one of the three districts which did not return any Fine Gael councillors. 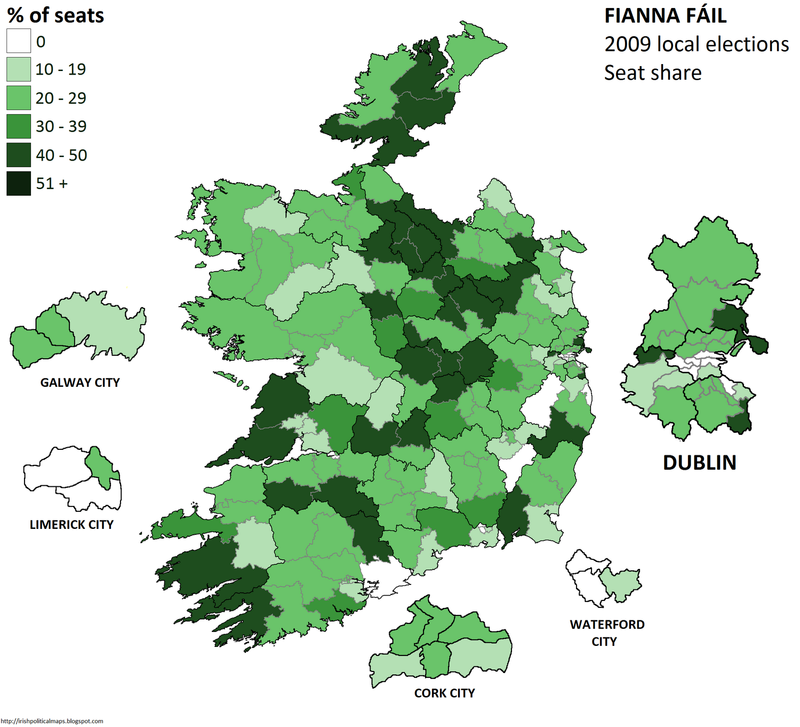 The deterioration of Fianna Fáil's vote which led to the party's near-demise in 2011 can be seen in action in the results of this election. Aside from some areas in south Kerry, Clare, Donegal and the south east, the strongest votes given to Fianna Fáil were confined primarily to the midlands. Brian Cowen's Offaly roots may have helped in this regard. Many districts returned no Fianna Fáil councillors: Midleton, Tullow, Baltinglass, Greystones and some areas of Dublin and Waterford cities each voted for other parties instead of the heretofore dominant Irish party. 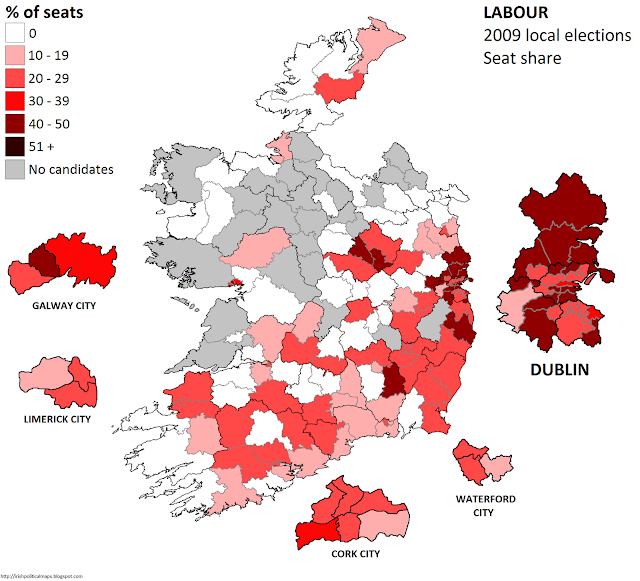 Knowing its base, Labour did not contest the majority of districts in Connacht and Ulster, as well as County Clare. Labour's great successes were in Dublin, where it became the largest party in three of the county's four local electoral areas, and in Galway City Council - an anomaly considering the party's lack of wide support in that area, but an anomaly largely attributable to the influence of Galway TD Michael D. Higgins. 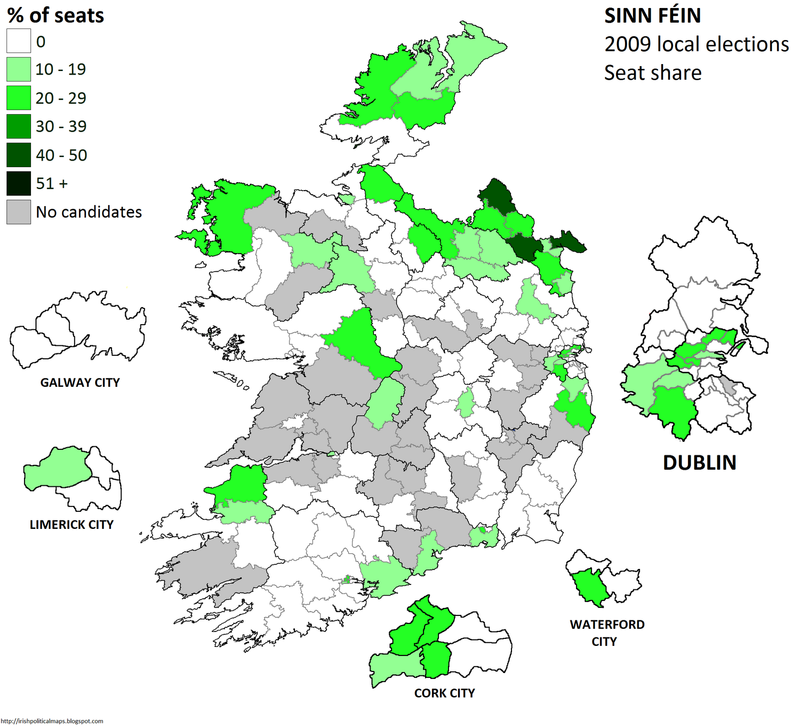 With just two extra seats from their 2004 result, Sinn Féin did not make any headlines with their performance in this election, but the result consolidated the gradual growth of the party in the republic since the 1990s. Monaghan County Council gave Sinn Féin a majority, with strong showings in other border counties and Dublin and Cork cities. These results gave the party a good base to work from during the 2011 general election. A vital component of local government, the country's various Independent Councillors increased in number by 10 to 275 in this election. The western counties and the east Leinster returned the largest concentration of Independents. The Socialist Party and the People Before Profit Alliance secured a good number of victories in Cork and Dublin. In 2010 they would join with the Workers and Unemployed Action Group to form the United Left Alliance. 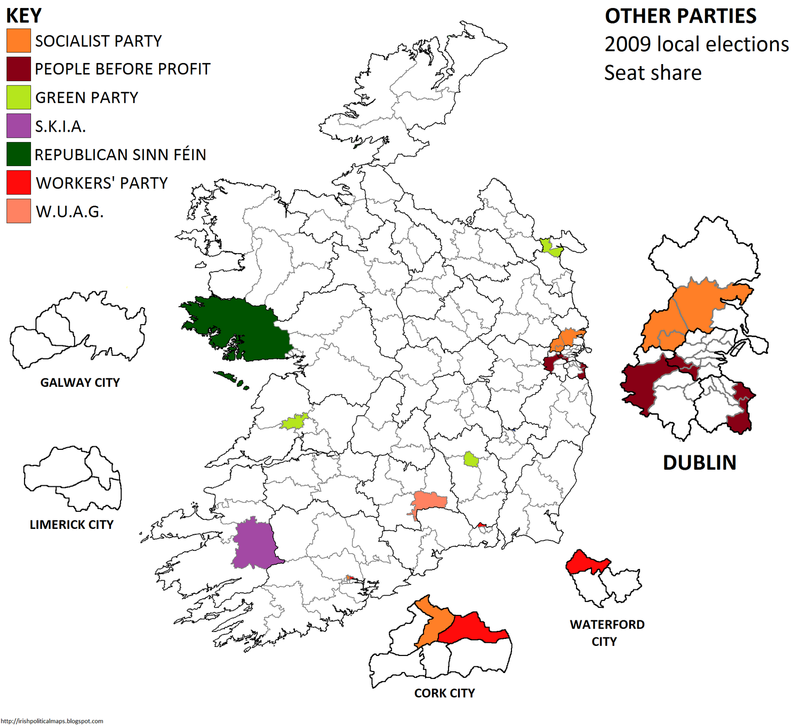 The Workers' Party, meanwhile, held their two seats in Cork and Waterford. One seat in the Killarney district of Kerry County Council was won by the South Kerry Independent Alliance, while the Green Party declined to represent only Ennis West, Kilkenny, Dundalk South, and a scattering of town councils. Republican Sinn Féin made a surprising gain of a seat in the Connemara district of Galway with 8.4% of the total vote.